It will help with DofE expedition planning. It will distract me from teaching and cause me to gaze at it instead of getting on with my work! Being able to see a trace of a four day Gold DofE expedition in one place will significantly help with planning (both me and the team). It will also help my Silver DofE team to get an idea of how far they have to walk during their three day expedition. 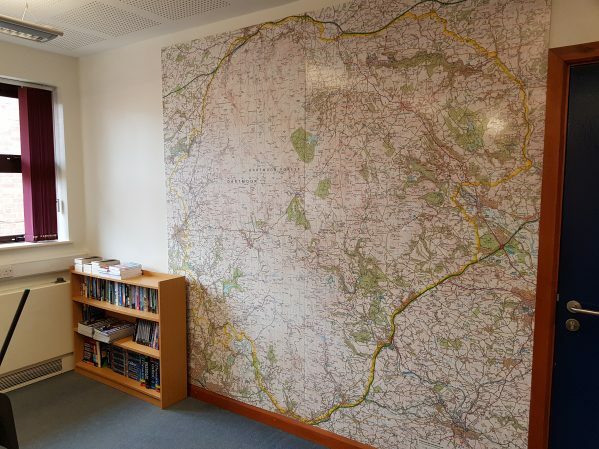 This foam backed wall map has been made by the brilliant Gomaps from Buckfastleigh. Have a look at their website for some fantastic map based products. I have already created my own wish list! How many map printed products in a home is too many? I have something similar on my dining room wall using the OS Road Map of Scotland, which incidentally shows excellent shaded contours and is almost good enough to use for walking. I mounted mine on hardboard and destroyed one set of maps experimenting with different adhesives, finally using spraymount, but that was not entirely satisfactory, but I do get much pleasure from perusing the map almost daily. Even so, I have always found difficulty in retaining a mental picture of geographical layout which is a bit sad for me as an enthusiastic outdoory.